Explanation: The hydrogen in your body, present in every molecule of water, came from the Big Bang. There are no other appreciable sources of hydrogen in the universe. The carbon in your body was made by nuclear fusion in the interior of stars, as was the oxygen. Much of the iron in your body was made during supernovas of stars that occurred long ago and far away. The gold in your jewelry was likely made from neutron stars during collisions that may have been visible as short-duration gamma-ray bursts or gravitational wave events. Elements like phosphorus and copper are present in our bodies in only small amounts but are essential to the functioning of all known life. The featured periodic table is color coded to indicate humanity's best guess as to the nuclear origin of all known elements. The sites of nuclear creation of some elements, such as copper, are not really well known and are continuing topics of observational and computational research. 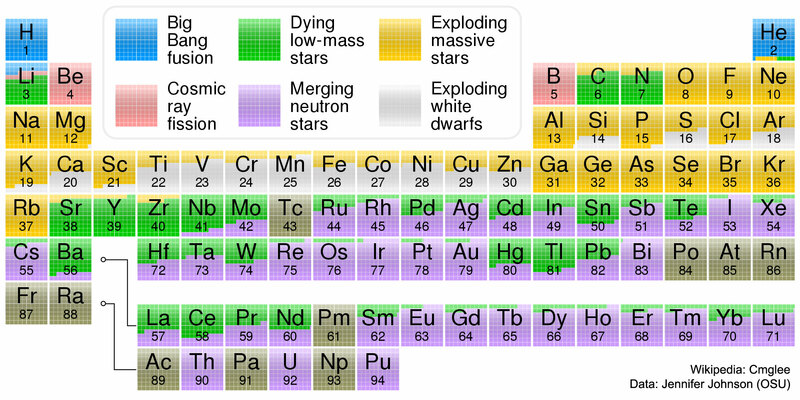 I find it quite interesting that dying low-mas stars make so many heavy elements. The key gives 6 colour-coded sources, but some heavy elements (starting with Technetium - element 43) are coded in grey, without an entry in the key. Do we not have information on them, or have I missed something? Those elements are created on Earth in the super colliders. Not (yet) known in nature. thearborist wrote: Those elements are created on Earth in the super colliders. Not (yet) known in nature. Thanks - that make sense. I had thought that it was only the trans-Uranium elements that were created in labs. I see that it's saying that Plutonium occurs naturally, which was news to me. Hey, all: Just a heads-up. There is a typo in your URL on this one. Where did the matter come from in the first place? That statement by thearborist about the gray coded elements not being known in nature is not precisely true. This periodic table is also somewhat out of date. The gray elements are produced in kilonova explosions. "The requested URL /apod/image/1710/Nuclelosynthesis2_WikipediaCmglee_2000.jpg was not found on this server." Does APOD monitor this forum, and can someone resolve that? This periodic table has stood the test of time so far. Attempts to create others have not gained a foothold. It does make one think another version (for example) might explain unknown aspects of the creation of our chemistry. Edit: Some of the grey coded elements are also daughter elements in the decay chains of elements like Uranium. 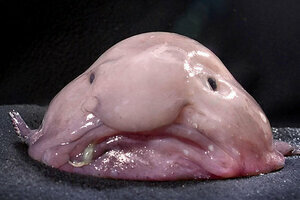 They are thus definately found on Earth in trace amounts. What about all the processes that don't happen, that have resulted in a Universe so impoverished of the other 2,567,845 useful elements that would have created so many amazing things? It's a cosmological disappointment of the highest order. That's the strong anthropic principle in a nutshell. It may be a universe with a vanishingly small likelihood of existing, but the fact that we're here to observe it means it's the only one possible. These are all naturally occurring elements. produced in small quantities as decay products of long lived radioactive elements such as Uranium. <<Of the elements with atomic numbers 1 to 92, most can be found in nature, having stable (such as hydrogen), or very long half-life (such as uranium) isotopes, or are created as common products of the decay of uranium and thorium (such as radon). The exceptions are elements 43, 61, 85, and 87; all four occur in nature, but only in very minor branches of the uranium and thorium decay chains, and thus all save element 87 were first discovered by synthesis in the laboratory rather than in nature (and even element 87 was discovered from purified samples of its parent, not directly from nature). All of the elements with higher atomic numbers have been first discovered in the laboratory, with neptunium and plutonium later also discovered in nature. They are all radioactive, with a half-life much shorter than the age of the Earth, so any atoms of these elements, if they ever were present at the Earth's formation, have long since decayed. Trace amounts of neptunium and plutonium form in some uranium-rich rock, and small amounts are produced during atmospheric tests of nuclear weapons. These two elements are generated from neutron capture in uranium ore with subsequent beta decays (e.g. 238U + n → 239U → 239Np → 239Pu). That's why I think that complex life is so rare in the Universe. So many factors have to come together to create the right environment for life forms such as ourselves to come into existence. I realize that there is another way of looking at this, which is to say that since we exist in the first place, the Universe has to be so tolerant of the existence of at least simple life that simple life has to be common, and if simple life is common, complex life can't be too rare. Then again, it is not so clear what "not too rare" actually means. It could conceivably mean that every there might be complex life in one out of every hundred exo-solar systems and intelligent life in, oh, one solar system out of a million? The latter figure ought to mean that there are very many intelligent species in our own galaxy alone. On the other hand, "not too rare" might conceivably mean that there is complex life on no more than one hundred planets in the entire Milky Way, and no other intelligent and technological civilizations than our own. And maybe there is intelligent life in only, say, one galaxy out of a thousand, or even fewer than that. Last edited by Ann on Tue Oct 24, 2017 4:17 pm, edited 1 time in total. FJ Piccino wrote: Hey, all: Just a heads-up. There is a typo in your URL on this one. This URL typo has now been fixed in the main NASA APOD. I apologize for the mistake. Ann wrote: That's why I think that complex life is so rare in the Universe. So many factors have to come together to create the right environment for life forms such as ourselves to come into existence. I look at data like we see in today's APOD and it reminds me of the ubiquity of physical law across the entire Universe. That the same stuff happens everywhere. Which would mean that complex life may well be found everywhere, as well. What 2+m elements are you talking about? “Chris Peterson” wrote: What about all the processes that don't happen, that have resulted in a Universe so impoverished of the other 2,567,845 useful elements that would have created so many amazing things? It's a cosmological disappointment of the highest order. Interesting observations gentlemen. Boomer’s is based on what actually exists, while Chris’ is based on what never has existed. Which is more solidly based, I ask rhetorically? Last edited by BDanielMayfield on Tue Oct 24, 2017 3:07 pm, edited 1 time in total.